Seeds - For the classically cheap. You can use grocery money on plants if you buy vegetables! It saves money in the end. The garden produce is a level of delicious rarely found in stores. You haven't lived fully until you've eaten a vine-ripe garden tomato. 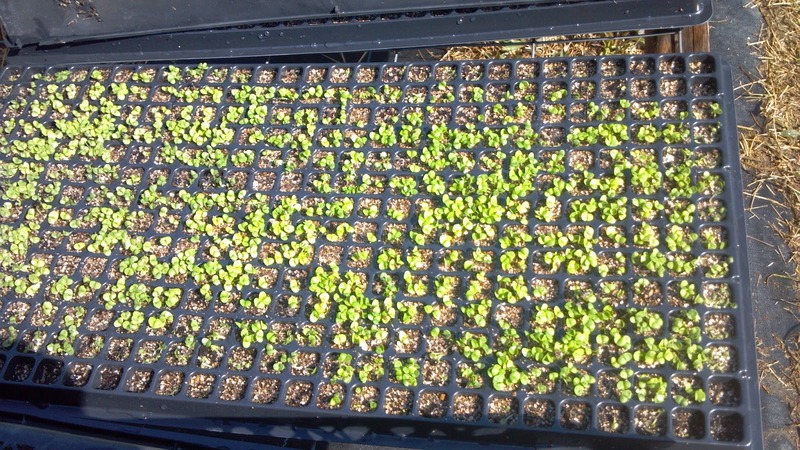 Few things reduce stress like lettuce seeds that sprout in two days. I want to live fully. I appreciate wonderful food, great architecture, beautiful landscapes and skylines and captivating aromas. I want to live life fully, but cheaply. Gardening has the perfect balance. It provides a healthy outdoor activity, exercise, sunshine and the high-end food ingredients that have become my unforgiving standard. Without the massive amounts of basil we grow each summer, we would have to sacrifice a lot or not keep my son in fresh pesto! Life would be hard. We grow and harvest about a pound of basil a week, from to containers on the patio alone! It would be money well spent - like paying for a gym membership but you get exercise AND great food. I still don't want spend much. Cheap. I do spend money on other things that I could be cheaper about: I don't change my own oil. - Make a list of the foods you cook most. Are there any ingredients you could grow? Even if you don't have experience, there are tons of resources to walk you through your gardening experience. Don't be afraid to branch out. (HA! I'm funny.) Successful gardeners didn't learn at Hogwarts. Get in touch with your caveman side and do what seems right! - What vegetables will your family eat? Since they won't all have the same growing season, you don't have to fit them all in at once. Smaller garden; Less work. - Some things can be stored easily, like garlic or carrots. Fresh, ripe tomatoes are a gourmet treat, but I don't can tomatoes. They tip the scale. Good, affordable ones are easily available in cans. But canning has it's place! My standard Xmas list is cayenne, garlic, dill-pickled beans. Realistically decide what you will have time for and concentrate on that. Some plants have a higher weighted average than others. Seize growing and propagation traits to optimize your wallet. Lettuce for instance has a tap root. The roots don't need to spread so it can be grown more thickly than other veggies. This approach backfires if you don't harvest it regularly. Plants that are crowded rot. Tomatoes root along the stem. Plant any broken pieces in a warm, sheltered place and they will become more plants! Look for bedding plants with more than one in the container. Because they root so well, they can be pulled apart and planted separately. Leftover basil or rosemary that didn't make it into the meal will often root if you put it in water in a clear glass in a bright window. 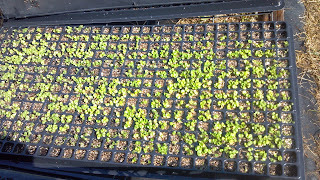 Once the ground warms up, seedlings usually catch up with purchased bedding plants. Soil amendments are vital to the success of your garden. Buy them if you have to, but don't overlook your immediate area. As long as your yard is not treated with weed killer and pesticide, use the grass clippings! Fallen leaves are like super-food to plants! If your neighbor has a big tree, offer to rake the leaves and use those. If you are going to spend money on the garden, soil amendments are your best investment! This blog is one of the resources you can use to navigate through your gardening experience! Please post your questions in the comments below. I will answer every one of them!